This write-up elaborates the undisputed power of Navamsha (D9) also called Dharmamsha and its majestic influence on Rashi chart. All alone, the Rashi chart is almost nothing! A very simple method of using Rashi Chart and Navamsha chart together is elaborated in Rashi Tulya Navamsha technique to pronounce results with certitude. Dharmasmsha shows blessings of Shri Vishnu and hence is crucial/primordial to say anything concretely based on Rashi chart only. Practical Case Study: The lady consulted me for some of the sever problems her children were facing. After all the discussion was over, she just had one question for herself. Q1. I have Raj Yogas in my chart but they have not yet functioned or given any results (She is already 60+). When will they fructify? I lead the life of a normal housewife. My answer was: No Madam, there are No Raj yogas in your chart! The yogas you are talking about in your Rashi chakra are not supported by Navamsha chakra or Shri Vishnu hence they will never fructify. Please do not expect any great results! Let us see why and how. The planets (grahas) forming raj yoga or dur yoga in Rashi chart if are placed in 6/8 or 2/12 positions in Navamsha then that yoga will not fructify or will give almost no results. We can see that in her Rashi chart there are many Laxmi (trines) Naryan (quadrant) yogas. The Lagna is considered both as a trine and a quadrant, so it is immensely auspicious for any native. The Lagna Lord (Mars) is placed in the 10th house and 10th lord (Sun) is placed in Lagna: it is a Raj yoga ( parivartana or exchange yoga) that assures great position and authority to a native. But are they supported by Navamsha (D9)? The answer is: No! 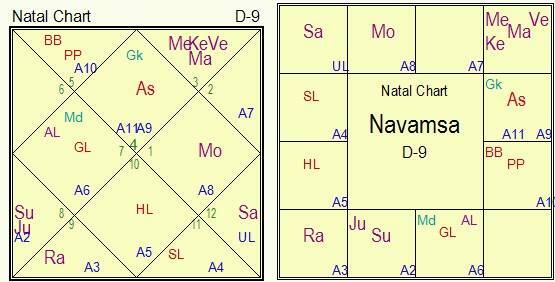 We can see that Sun and Mars are placed in 6/8 houses from each other in Dharmamsha (D9). The story of this yoga is unfortunately over, after observing this! 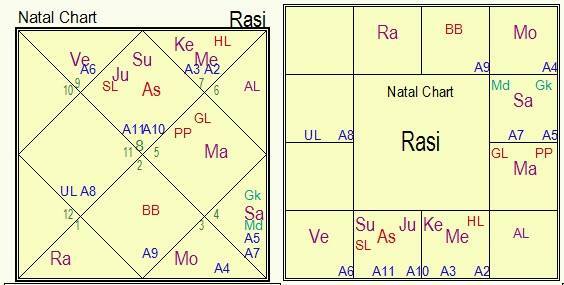 Further, we can see in Rashi chart that Sun (being quadrant lord of 10th house) and Jupiter (being trine lord of 5th house) are conjoined together and they form Raj yoga. Rule: Planet X placed in the sign of planet Y will not give full results when these 2 (X and Y) are placed in 2/12, 6/8 Houses from each other in Navamsha (D9). We can that Jupiter and Sun are placed in Scorpio in Navamsha (D9) but both Mars and Ketu lords of Scorpio are in 6/8 house from both Sun and Jupiter in Navamsha. Hence this yoga will also not fructify also. So accordingly we should first check the Navamsha chart and evaluate the support for any good or bad yoga present in Rashi chart and then only pronounce results.